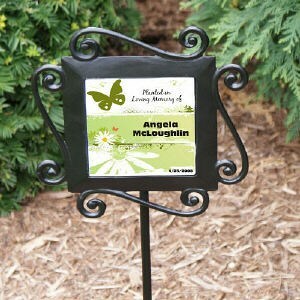 This Memorial Garden Stake is a beautiful accent to any Memorial Garden and is a unique way to mark a Memory Tree, Rosebush or any memorial. Made of heavy-duty wrought iron, it measures 28" H x 8.5" W with a 4.25" ceramic tile insert. Personalize with any two lines and any name and date.